Lose yourself in the Alpujarra mountains of Andalucia and rediscover total peace and relaxation. Our holiday home enjoys stunning views of the Sierra Lugar from the terrace, set in a private garden of olive and fruit trees with private swimming pool. The house has the modern comforts of home whilst enjoying the delights of the Andalucian countryside. It has 2 spacious bedrooms, bathroom, kitchen and living room which leads out through French doors to your private patio which provides shade for outdoor breakfasts etc. Private entrance with car parking area. Terrace with BBQ, and access to the gardens. Feel free to pick your own grapes, figs, oranges, pears, lemons or avocados when in season. Perfectly situated for a slice of real Spanish life, winter skiing, mountain villages and the beaches of the mediteranean are all on your doorstep. Things to see and do: The Alpujarras offers a wide range of activities including horse riding, paragliding, bird-watching and skiing in winter. You can visit the city of Granada with the famous Alhambra (we recommend you book in advance for this most popular attraction, advance tickets can be bought on https://tickets.alhambra-patronato.es), the caves at Nerja and the spa town of Lanjaron. Mini Hollywood near Almeria is 2 hours away, or just explore the villages of the region with their whitewashed cottages and bougainvillaea covered walls. For the golfers there is an excellent course at Motril. It is adjoining the beach so for the rest of the family who dont want to play can enjoy other relaxation. Take it easy: For those who just want to 'chill' it is a great area to relax and do nothing, read a book, take a dip in the pool with the stunning mountains as a backdrop. Orgiva: Orgiva is a busy market town with several supermarkets, banks, 2 internet cafes and a variety of bars and restaurants.. Market day is Thursday. We first came here because family were already living in Orgiva, and gradually fell in love with the area and decided to follow in their footsteps. Loved the property and it’s location. We found the property spacious, well equipped and spotlessly clean. We have been coming to this area for 25 years and this is probably the nicest place that we have stayed. The peace and quiet made this a very relaxing stay with the pool and garden an added bonus. Sheila and Jack were ideal hosts; nothing was too much trouble. We are already making plans for a further visit! Sheila and Jack even arranged for the sun to shine for 14 days! We loved our stay at Sheila and Jack's holiday house, fantastic location surrounded by beautiful mountains, gorgeous garden and pool, and well equipped house with everything we needed for a comfortable holiday. Sheila and Jack were very helpful and friendly, we could not have asked for a better stay, and hope we can return next year. We had a lovely holiday in this idyllic spot with friendly and helpful hosts, Sheila and Jack. Nothing was too much trouble and we definitely hope to be back but for longer the next time. Thanks again. Happy New Year to you both, looking forward to seeing you again sometime! Our last stay in Orgiva was 9 years ago so we were a little apprehensive about returning . We needn't have been - Casa Pepe Rosa was perfect for us. A comfortable house in an open, well- maintained garden with stunning mountain views in all directions. I could have spent all week just sitting watching the ever- changing light ( with a glass or two of wine!) but we knew that the surrounding area was stunning so we travelled up into the mountains and to the coast to walk and swim. Orgiva is well situated to visit so much beautiful scenery in the area with lots of tracks near to the house to walk and run on. The pool, although quite small was just what we needed to cool off in the hot October, afternoon sun followed by drinks under the ancient olive tree. We didn't feel the need to eat out much - just one lunch at Teteria Baraka in Orgiva to celebrate a special anniversary. We loved the Arabic food and the ambience in the restaurant. Maybe next year when we return we'll try others. We enjoyed every minute of our week in Orgiva - Jack and Sheila made sure that everything ran smoothly from booking to leaving with lots of helpful information. Looking back at our holiday will get us through the miserable British winter. Stayed here from 21st August to 30th August with my wife and our daughter, situated about 90mins away from Malaga Airport, Lovely location away from it overlooking the mountains, private gated entrance and its own pool and unlimited wifi which was a great hit with our daughter. Holiday home was lovely with lovely porch covering area which we spent many of an evenings sat passing the time away, kitchen area had everything we needed which was good we also had access to Sheila & Jacks Freezer which was very useful as fridge only has a small compartment for frozen items. Bedrooms were basic though comfortable, requested extra pillows prior to our arrival which was good. Plenty of space to sit and relax not just by the house but also next to the pool which was lovely to just get in and out when we wanted to. From time to time were visited by Sheila and Jacks dogs Missy & Holly. Spent many of an evening sat relaxing watching the world pass by, though we also watched the Thunderstorms and Lightening pass round the back of mountains something to behold. Sheila & Jack have a great deal of knowledge which proved to be useful. Situated 10mins drive just outside Orgivia which in itself is a lovely town, with plenty of bars and places to eat, some of which we visited. We spent various days out and driving the mountain roads in all directions from Orgivia, there are some very lovely places, if you get the chance visit Trevelez on A4132 which is about a 90min drive from Orgivia, its a lovely mountain village with plenty of shops and places to eat though roads are very bendy and Lanjaron on the A348 about a 30min drive, which has a lovely selection of shops especially if you are looking for something to bring home this would be a place to certainly visit also has a good selection of places to eat and drink. Motril is about 45mins from Orgivia, this is a very big town which is excellent if you need a supermarket or looking for places to shop, the other side of Motril is Playa de Motril, this is the beach area which has a selection of places to eat mainly seafood but if you come across it stop at Happy Beach great for pizzas!!! And very good value for money. 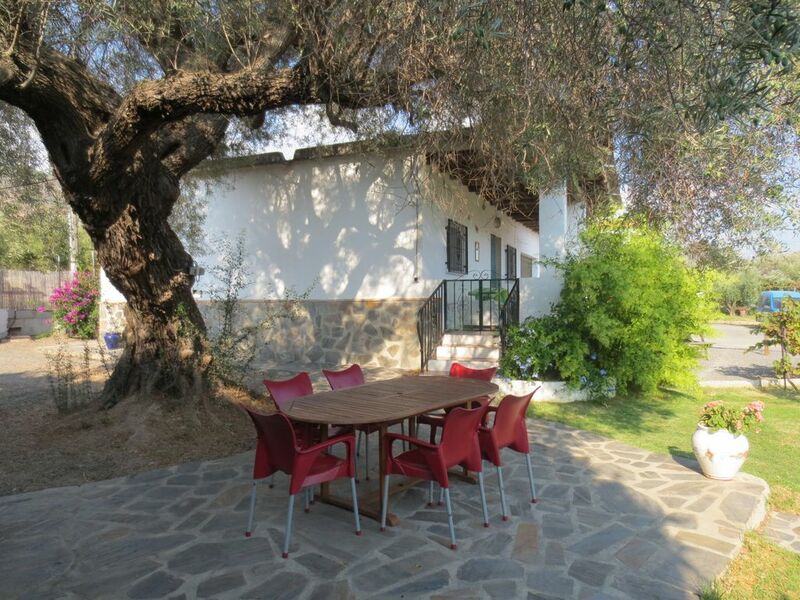 Orgiva is the capital of the western Alpujarras, just 3/4 hour from the city of Granada. The beaches of Motril, Salobrena etc are approx. 35 minutes drive. The area is one of the last remaining regions where they serve free tapas with a drink!